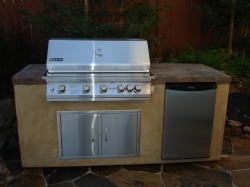 Jenn-Air BBQ Grills are available in 32 inches or 38 inches. Also, you can ONLY up-grade to a SEAR ZONE Burner if you get the 38 inch BBQ Grill. 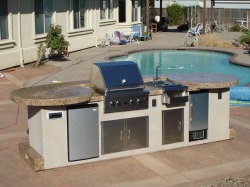 Choose from any of our pre-frabricated Barbeque Islands or custom outdoor kitchens with built in umbrella holder. 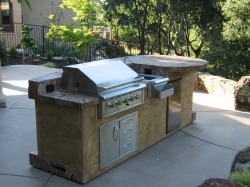 Authorised Alfresco Grills and Accessories Dealer. We don't sell Alfresco over the Internet. We can only sell them at our show room. Important Note: If you do buy over the Internet you void the Alfresco Manufactor Warrentee. Authorized Dealer for OCI Grills & Accessories. 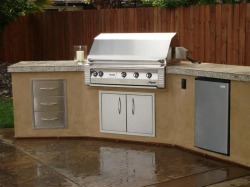 Authorized Viking Grills & Accessories Dealer. We Don't Sell Viking over the Internet. We can only sell Viking at our showroom.